The establishment comprises a total of 30 accommodation units. A lobby and a reception are available to guests as well as the Restaurant and Pool Bar. All accommodation units feature a kitchen and a bathroom. A balcony or terrace can be found in most rooms. The accommodation units each feature separate bedrooms. A safe is also available (with cost). The kitchenettes of the accommodation units are appointed with a fridge, a microwave and tea and coffee making equipment. A TV is also available. Each of the bathrooms features a shower or a bathtub. 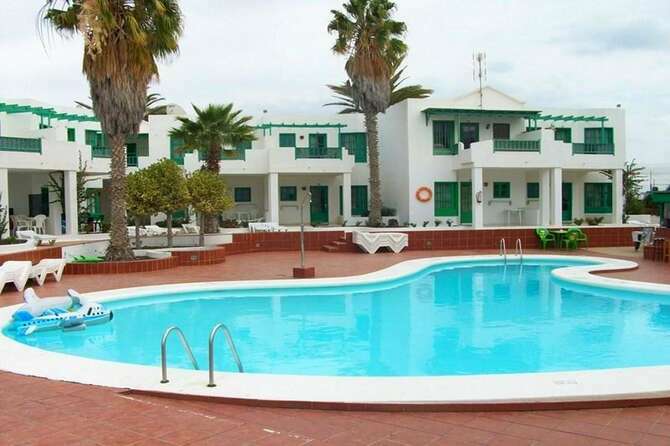 This simple apartment complex is centrally located in the town and tourist centre of the town yet still offers a quiet stopover point for those visiting the area. The nearest beach is approximately 600 m away and various shopping facilities, restaurants, bars and nightclubs are located in the hotel’s vicinity. Convenient public transport links are to be found within a few paces of the complex (600 m). Sport and entertainment options are available at the establishment. The swimming pool is ideal for a refreshing dip. A terrace, a sun terrace, sun loungers and parasols are available. Various refreshing drinks are available from the poolside bar. Cleaning once per week with change of towels.